With the focus of the National Guard’s efforts over the last 14 years, centered on the War on Terror, it is important as Soldiers in the National Guard to be able to respond domestic events as well. 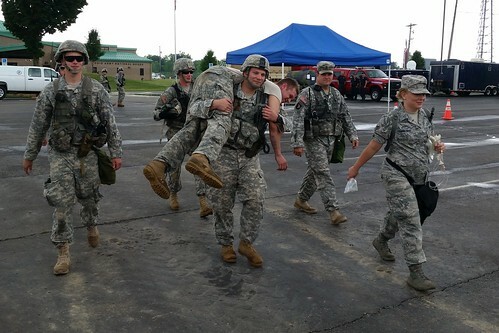 Soldiers from Bravo Co. participated in one of the largest regional, multi-agency exercise in the history of the Kentucky Guard June 16-18. Acting as the Quick Reaction Force for a Special Focus Event known as Operation Guardian Shield, the infantrymen quickly assembled at their home station, loaded their equipment, and deployed to the exercise site in less than 7 hours. In conducting this full scale exercise event, the 40 participants flew from London, Kentucky to Rickenbacker Air National Guard Base, Ohio in a C-130 provided by the Ohio National Guard. The soldiers then conducted a quick Joint Reception, Staging, Onward Movement, and Integration (JRSOI) briefing describing the situation on the ground. From there the Bravo Co. participants loaded up onto four UH-60 Blackhawk Helicopters and departed for Camp Sherman, Ohio were they would begin their exercise. The scene at the incident site was a train derailment caused by a domestic terrorist organization (for exercise purposes only). The train was carrying hazardous materials which were in theory released into the air. 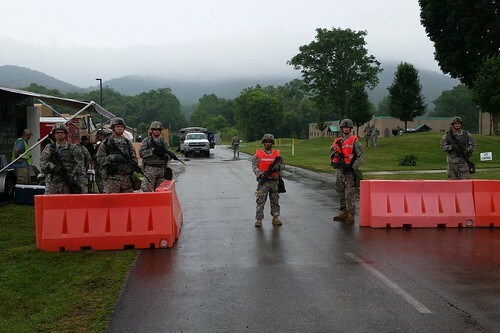 Bravo Co.’s job worked with the incident manger, local law enforcement, local fire departments, and the CBRN Enhanced Response Force (CERF) to provide security to the site, help evacuate casualties, and prevent decontaminated personnel from entering into the contaminated zone and vice versa. Rubble and debris from the derailment site could be seen everywhere. Role players were hired to act as casualties, on lookers, family members searching for loved ones, and members of the media to make the scenario more realistic. Throughout the day Bravo Co. established and manned a tactical control point, provided litter assistance for casualties who had undergone the decontamination process, conducted a wide area search for survivors, and treated multiple simulated casualties for a variety of injuries all while wearing their protective gas masks and equipment. With such a large-scale event involving a variety of organizations, interagency communication was difficult but vital to the exercise. 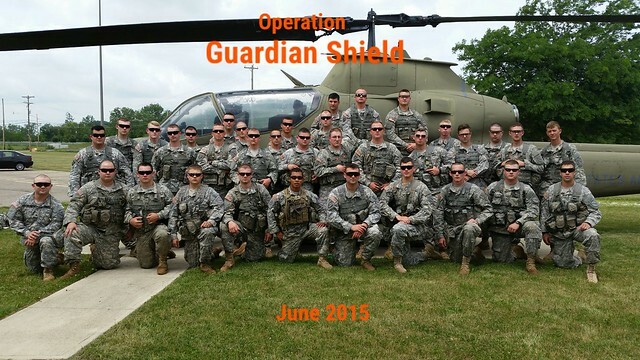 Along with Soldiers from the Kentucky Guard, Operation Guardian Shield included Soldiers and Airmen from Indiana, Illinois, Pennsylvania, Georgia, West Virginia, Ohio, and National Guard Bureau. Also, representatives and agents from the Department of Homeland Security, FBI, FEMA, Civil Air Patrol, Red Cross, and Ohio Emergency Management were all on the scene. This made the need for coordinated communications extremely important. At the conclusion of the exercise, all 40 Bravo Company participants loaded up onto to the UH-60s, returned to the air base, loaded onto a C-130 and returned to London where they officially ended their mission.